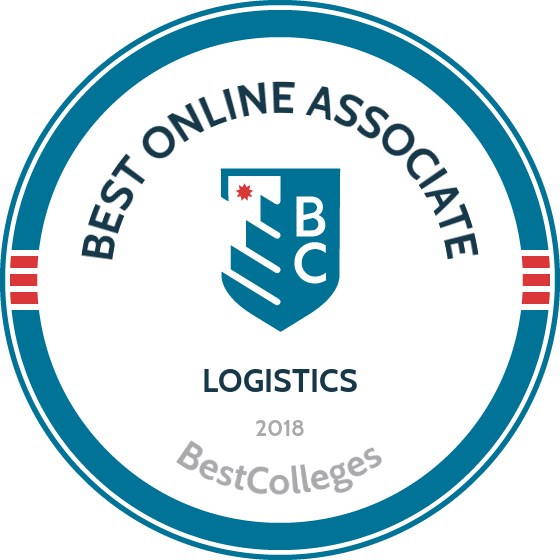 What Are The Best Online Associate in Logistics Programs? What Will I Learn in an Online Logistics Program? What Can I Do With an Associate Degree in Logistics? If you're interested in a career in warehousing, distribution, transportation, or purchasing, an associate degree in logistics online program may be a great option. You'll gain managerial and leadership skills, while developing critical decision-making, critical analysis, and organizational competencies. According to the BLS, the field of material moving has a projected growth of 5% — average among all occupations. If you decide to further your education with a bachelor's or master's degree, you could find work as a purchasing manager, which pays more than $100,000 per year. If you're ready to pursue an online logistics degree, browse this guide for information on how to apply, typical coursework, job outlook, and more. Located in Georgia, ATC offers an 80-week, 60-credit associate of applied science in business logistics management degree. The curriculum for this online logistics degree covers idea conception and product delivery to provide students with both an overview of business logistics and knowledge in customer service and supply chain management. Required courses include organizational behavior, leadership, change and career management, research and case studies, and materials management. Graduates become industrial production managers, quality control systems managers, and storage and distribution managers. Applicants must hold a high school diploma or GED and must submit COMPASS exam scores. Admitted students take the SmarterMeasure Distance Learning Readiness Assessment before enrolling in classes. Online courses are delivered through Blackboard. Founded in Winston-Salem, North Carolina, in the 1960s as an industrial education center, FTCC offers a 67-credit associate in supply chain management with an emphasis in global logistics technology. Students earning their logistics degree online study transportation, finance, economics, warehousing, material handling, and purchasing, while gaining practical skills in operational analysis and risk management. Online coursework is delivered through Blackboard and includes principles of management, international business, business law, import/export management, and macroeconomics. Most students complete FTCC’s logistics program in five semesters. Applicants must submit high school transcripts or their equivalent and must take placement tests before enrolling. Successful logistics students possess good math, computer, communication, and organizational skills. Located north of Seattle, SCC offers a 90-credit associate in purchasing and supply chain management. Students earning this associate degree in logistics online examine policies, procedures, planning, and organization of purchasing. Classes are delivered through Canvas and include material management, sourcing and supplier relations, contract management, project management, and business fundamentals of sustainable business. Graduates pursue logistics careers in construction companies, government agencies, and educational institutions. The program can be completed in two years. Financial aid is available in the form of grants, loans, and work-study programs. Out-of-state students may apply to waive the nonresident tuition differential. Recognized as a Hispanic-serving institution by the U.S. Department of Education, PAC offers a 60-credit associate degree in logistics and supply chain management. Students who complete their logistics degree online gain leadership and managerial skills through classes including warehouse and distribution center management, principles of marketing, production and operations management, business law, and quality management. Students complete a capstone internship, during which they apply specialized occupational skills and concepts. Most students complete PAC's logistics program in five semesters over two years. Graduates pursue careers in transportation, distribution, and purchasing. PAC is part of Alamo Colleges District in Texas, so students enroll in courses using AlamoENROLL. GMC offers both an associate of arts and an associate of science in logistics management. The AA degree requires 70 quarter hours, and the AS degree requires 65 quarter hours. Each track includes coursework in communication, humanities, ethics, natural, sciences, technology, and social sciences. Distance students in this associate degree in logistics online program gain critical analysis and decision-making skills, as well as experience with accounting software and data comparison. GMC is an open-admissions institution, which means there are no SAT or ACT score requirements. Applicants must hold a high school diploma or GED. Both in-state and out-of-state students pay the same affordable tuition, and 80% of students receive some form of financial aid. Originally chartered as an industrial education center in 1958, DCCC in Thomasville, North Carolina, now educates approximately 16,000 students each year. DCCC's 68-credit associate in global logistics and distribution management technology covers purchasing, supply chain, warehousing, inventory control, and manufacturing organization. Students earning this logistics online degree gain a broad understanding of international and domestic transportation of goods. Graduates succeed in a variety of positions within manufacturing and service organizations. Required courses include quantitative literacy, fleet management, world regional geography, import/export management, and database concepts. Online students have access to the school’s learning commons, Moodle tech support, and 24/7 live support. Part of the Technical College System of Georgia, CTC offers an online degree in logistics, which requires 62 credits, including 15 general education credits. The associate of applied science in logistics and supply chain management focuses on procurement, business management, and accounting principles. Courses include purchasing, materials management, key issues in the global integrated supply chain, and ecommerce. Students complete a capstone, in which they evaluate and present case studies. Online coursework is delivered through Blackboard, but distance students are required to attend at least one proctored exam. Students have access to free online tutoring through the academic success center. Applicants may submit SAT or ACT scores in lieu of taking the ACCUPLACER placement test. With more than 70,000 students enrolled per year, WTCC is the largest community college in North Carolina. The associate in supply chain management and global logistics technology requires 65 credits. Graduates who have earned their associate degree in logistics online pursue careers within transportation, warehousing, and manufacturing organizations, as well as government agencies. Students may also pursue professional certifications while earning their degree. Delivered through Blackboard, classes include critical thinking, logistics security, business analytics, and principles of marketing. Students can complete the program in four semesters and have access to individual tutoring. First-time distance learners must complete an introduction to eLearning course before enrolling. With a commitment to providing lifelong learning opportunities, AWC offers one of the best online logistics degrees in the country. The 64-credit program comprises 27 major credits, 21 general education credits, and 15 departmental credits. Students gain an understanding of logistics, business, inventory, transportation, and warehouse management to prepare for positions in private and public sectors. Classes include computerized logistics, freight claims and contracts, personnel supervision, and international logistics. Online students complete a three-credit internship and have access to the student success center, tutoring, advisors, and the library. Courses are offered in sessions lasting 8, 12, and 16 weeks. WKCTC’s online logistics degree program is taught primarily online and requires 61 to 66 credits, including 18 general education credits. The curriculum comprises classes such as managerial accounting, global economic issues, operations management, lean for logistics, and supply chain management. While earning their logistics degree online, students may also complete certificate programs such as international logistics, logistics technology, and supply chain management. Students gain competency in safety, quality control, communications, and teamwork and are eligible to receive training from WKCTC’s Workforce Solutions program. WKCTC has no admission requirements except a high school diploma or GED. New students must complete an orientation before enrolling. While curriculums in programs vary, all online logistics degrees include coursework in warehouse and distribution center management, production and operations management, and import/export management. Distance learners also take courses in communication, humanities, technology, and social sciences. Distribution Management: This course examines the techniques and tools used to manage warehouses and distribution centers. With a focus on operations, safety, material handling, productivity, and costs, students gain an understanding of how warehouses and distribution centers function in business and logistics. Supply Chain Management: Covering topics like eCommerce, materials management, purchasing, delivery, and customer service, students in supply chain management courses learn about acquiring, purchasing, manufacturing, assembling, and distributing goods, services, and products. Import/Export Management: This course examines the components of import and export operations, including regulations, technology, transportation, documentation, finance, and homeland security. Students in this course gain a deep understanding of how to perform import and export operations. A logistics degree online is a great option if you're interested in purchasing, manufacturing, materials management, warehousing, inventory, or transportation. Specific career paths include entry level purchasing, warehouse management, installation and logistics support, maintenance planning, billing analysis, and materials moving. These careers require you to juggle multiple projects while maintaining a positive, assertive attitude. Additionally, you'll need strong communication skills to manage and maintain high-quality service and regulatory compliance. A degree in logistics also prepares you to continue your education with a four-year bachelor's degree in business, business administration, logistics management, supply chain management, or a related field. You may decide to pursue professional certifications in production and inventory management, supply chain professional, or transportation and distribution. You'll also have the opportunity to join professional organizations such as the Association for Operations Management, the Institute of Supply Management, or the International Warehouse Logistics Association. Warehouse managers are responsible for driving profit goals and handling the demands of all facility operations, including distribution, maintenance, quality, service, and compliance. They manage multiple projects from beginning to completion, while also mentoring and supervising employee performance. Billing analysts are detail-oriented, have strong analytics and problem solving skills, and the ability to plan and multitask. They are responsible for preparing and submitting customer invoices, monitoring customer contacts, reconciling billing, and resolving customer disputes. Logistics and supply chain analysts monitor and track metrics and analyze data to improve strategies surrounding supply chain, distribution, supplier management, and transportation. They establish logistical purchasing, receiving, and inventory strategies, policies, and procedures. Earning a logistics degree online is great preparation for a bachelor's or master's degree. Many associate programs are transferable to a four-year bachelor's of arts or science degree. Degree tracks are available in business administration, supply chain management, or logistics management, and translate into any number of business operations careers. According to BLS, the U.S. can expect more than 600,000 new jobs in this field over the next several years. Many of these jobs -- such as buyer and purchasing agents, cost estimators, logisticians, and management analysts -- require a bachelor's degree. Bachelor's of Business Administration: With a bachelor's of business administration, distance learners study nearly every aspect of business -- finance, human resource management, information systems, and project management. This program features coursework in entrepreneurship, global logistics management, marketing, and public administration. Bachelor's of Arts in Supply Chain Management and Logistics: Detailing procurement, scheduling, transportation, quality, and warehouse management, a bachelor's degree in supply chain management examines the entire supply chain process to optimize the customer experience. Students build on their knowledge from their associate degree and gain core business knowledge. Bachelor's of Arts in Organizational Management: In an organizational management program, learners pursue the human side of business management. Coursework covers ethics, communications, human resources, personal leadership, work behaviors, workplace issues, and team development. Students in this program learn effective strategies to lead an organization. Upon completion of your online logistics degree, you can join various professional organizations that serve the supply chain, operations, and logistics communities. In addition to annual conferences and other networking events, members of these organizations benefit from continuing education, career services opportunities, local roundtable conferences, seminars, webinars, digital libraries, online discussion communities, and job boards. Organizations also offer quarterly reports, magazines, and other members-only literature, which are great ways to stay informed and ahead of your business competition. APICS is a globally recognized leader and supplier of supply chain training education, certification, and endorsement programs. An important part of APICS is the Supply Chain Council, a nonprofit organization that aims to advance supply chain through research and publications. CSCMP is a professional organization dedicated to career development, networking, and continuing educational opportunities within supply chain management. CSCMP offers an annual conference for members, where professionals discuss cutting-edge supply chain solutions. Offering education and networking opportunities to systems and software manufacturers, systems integrators and simulators, logistics providers and publishers, MHI is the largest material handling, logistics and supply chain association in the United States. Focused on logistics management and its role in supply chain, WERC offers industry professionals multiple opportunities to network, attend educational events, and gain expert insights. MERC boasts an annual conference for distribution practitioners and suppliers. The specific industry in which you work after earning your logistics online degree will impact your annual earnings. As the table above demonstrates, one's level of professional experience (entry level, mid-career, and late-career) affects salary expectations for all positions, especially operations managers. Purchasers and warehouses managers can expect an income on the lower range, while operations managers and buyers typically earn a higher income. Student loans, grants, and work-study programs are available at most schools to pay for your associate degree in logistics online program. Your first step should be completing the Free Application, for Federal Student Aid (FAFSA), which determines your eligibility for federal scholarships, grants, and loans. Additionally, some schools and professional organizations offer merit-based scholarships. For example, regional chapters of the Council of Supply Chain Management Professionals in Arizona and Texas each offer scholarships.